Ridgefield has had its share of colorful characters but few could match Ely Culbertson, anarchist, revolutionary, politician, author, peace promoter, and – above all – contract bridge expert and promoter. Born in Romania in 1891 of a wealthy American father and his Russian wife, Culbertson grew up in the Caucasus, but as a teenager studied briefly at Yale and then Cornell, dropping out and returning to Europe where he fell in love with Nadya, daughter of a Georgian princess who was deep into the plottings of the local nihilists and anarchists. According to his own story, Culbertson began a career as a professional card player as a means of supporting the revolutionary movement. Nadya was eventually murdered and Culbertson imprisoned after an unsuccessful attempt to assassinate a local governor. His father rescued him, but he eventually stowed away on a ship bound for Mexico where he took part in more revolutionary plottings, winding up in prison again. After his release, he went to Spain for yet another revolutionary effort, then finally settled in Paris where he studied at the Sorbonne. By 1921, he was in Greenwich Village, supporting himself by playing bridge and developing a bidding system that became world famous. In 1923 he married Josephine Murphy Dillon, who taught auction bridge and was a top woman player. Together they promoted his new version of the game, contract bridge. To gain publicity for the game, they’d stage challenge matches — one in 1931-32 lasted six weeks, made the front pages of hundreds of newspapers, and was covered on radio and in newsreels. 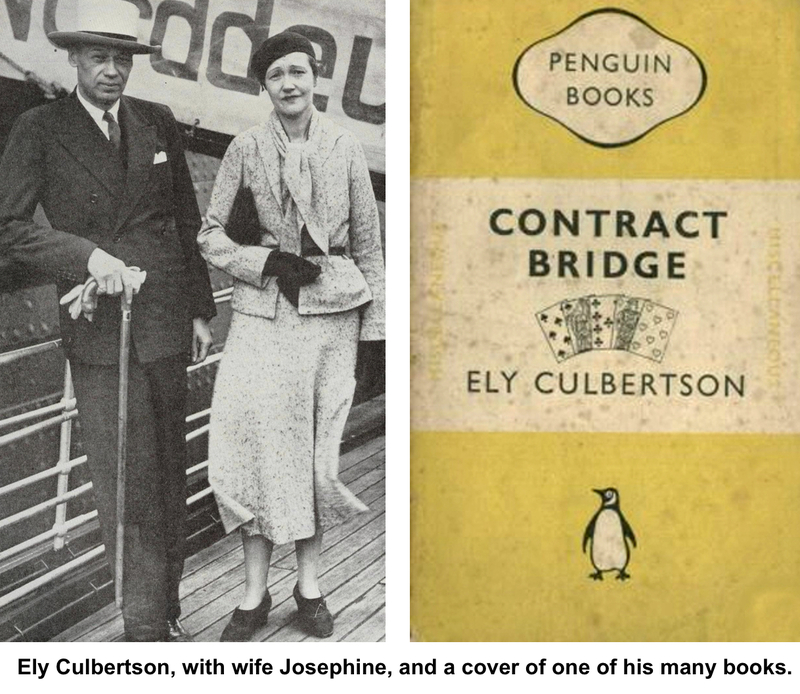 Culbertson wrote many book on bridge during his career. “A deck of cards is built like the purest of hierarchies, with every card a master to those below it, a lackey to those above it,” he said in one of them. 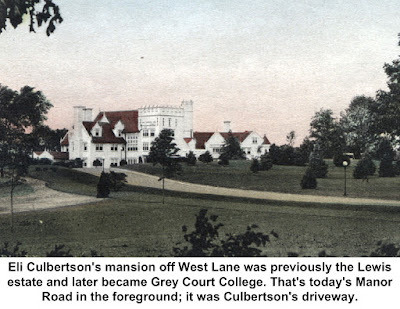 In the mid-1930s, at the peak of his career, Culbertson bought the huge Lewis estate on West Lane, and while there wrote his autobiography, “The Strange Lives of One Man.” He also ran for Congress, but didn’t get far. By 1940, he was in financial trouble, and his home was foreclosed. 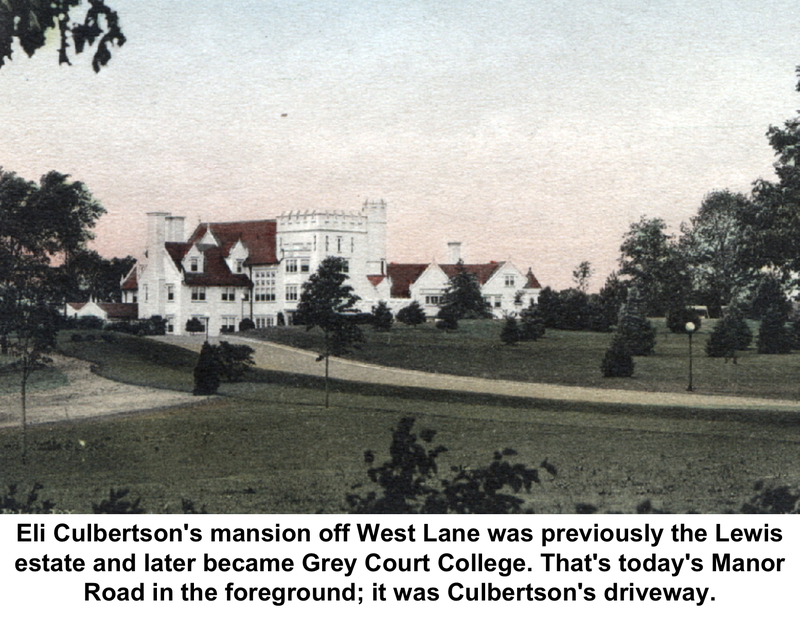 It became a college, then a resort and was finally torn down and the land subdivided into the Ridgefield Manor Estates. Culbertson wrote several books proposing a United Nations-like system — he was like a one-man UN himself: he spoke Russian, English, French, German, Czech, Italian, and Spanish fluently, could read and understand Slavonic, Polish, Swedish, Danish, and Norwegian, and knew Latin and classical Greek. He died in 1955 in Vermont at the age of 64. The Bridge World in 1964 named Culbertson along with Charles Goren and Harold S. Vanderbilt as the first three members of a Bridge Hall of Fame, now maintained by the American Contract Bridge League.